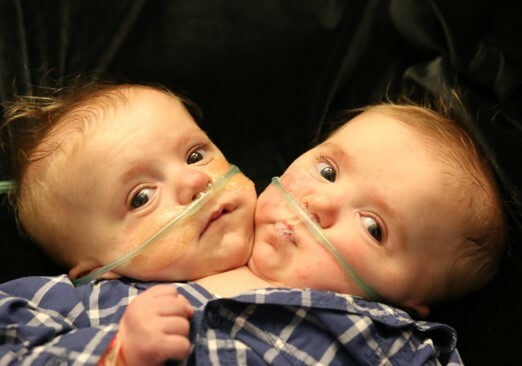 Elijah James Kroeger and Isaac Gabriel Kroeger, age 7 months, infant twins of Jason Marc Kroeger and Heather Lynn Justice Kroeger of Asheboro returned to their Heavenly home Friday, April 6, 2018, from Cincinnati Children’s Hospital where they were born on Tuesday, September 5, 2017. During their short life on earth, they were embraced by the love of their parents, Jason and Heather; three brothers, Jacob, James and Isaiah; two sisters, Elizabeth and Julia; their maternal grandmother, Lynn Justice, and their paternal grandparents, Theresa and Paul Wisotzke. Other survivors include an uncle, two aunts, cousins and their paternal great grandparents. Awaiting their arrival in Heaven was their sibling, Gabriel, and their maternal grandfather, Larry Justice, who had preceded them in death. Visitation with family and friends will be from 6:30 until 8:30 Monday, April 16, at Davie Burial & Cremation Service of Lexington located at 1403 S. Main Street. Services will be conducted at 11:30 AM Tuesday, April 17, at St. Joseph Catholic Church, 512 W. Wainman Avenue, Asheboro, officiated by Rev. Father Fidel Melo. The twins will lie in state for one hour prior to the time of service. Following the service, interment will be in Randolph Memorial Park. In lieu of flowers, memorials may be sent to Ronald McDonald House Charities of Greater Cincinnati, 350 Erkenbrecher Ave., Cincinnati, OH 45229, which has been tremendously supportive of the family during these difficult months. Arrangements are under the direction of Davie Burial & Cremation Service of Lexington. Online condolences may be posted at www.daviefunerallexington.com.